"I don't predict snowstorms, women or elections." After all of the storm damage and alI of the power outages and all of the sweltering nights without air conditioning and ice cubes, we thought everyone could use some snow. Or at least pictures and video of snow. And some Pat Collins. A generator keeps one room heated for five dogs, five parrots and a dozen exotic fish. Ambulances are getting stuck; fire departments are deploying four-wheel-drive vehicles to pull them out. Some residents of Price George's County are angry because they haven't been plowed out after the first storm. Subcontractors for VDOT have worked 12-hour shifts for days now. Some snowplow drivers love the show, and others are ready to throw in the towel. "There hasn't been a plow here in... There hasn't been a plow here." One resident in Burke, Va. is literally sawing the snow out. Residents on a long, sloping street are getting to know that long, sloping street really, really well. Thanks for the Memories, Blizzard of 2010! NBC4's Pat Collins breaks out the yardstick once again; Tom Sherwood gets a free plastic bag to keep his notes dry; Elaine Reyes makes a snow sofa. Some residents fled to hotels; one house dropped to 46 degrees. NBC4's Tom Kierein recalls the worst storm he's lived through: "Five Days in February." The steps were buried under two feet of snow, so folks grabbed plastic signage and went sledding. The food in the fridge went bad, so now a convenience store is the only option left. Which Truck Is Pulling Which? A box truck gets truck and needs to be hauled out by a pickup. Who knew? When the going gets tough, the tough get cross-country skis. A fur hat and leggings are perfect for a trip to conduct a guest snow measurement. Good news, everyone! No guns at this one! Watch the misery just pile up... literally. An NBC employee braves the snow and sleet to make it to work. Yeah, we're pretty much like UPS. She declines to give her name... but she's walking three miles to get a sandwich from Giant. Oh, and a picke. Two co-workers got more than they bargained for when they tried to push their van out of a ditch. 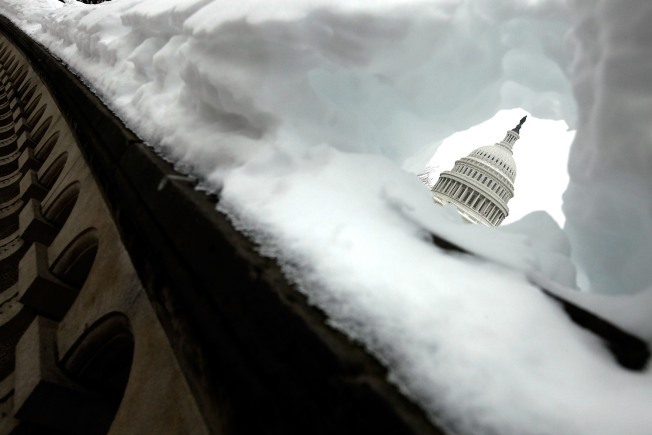 D.C. was quieted by the snow -- except for some accidents, including three involving snowplows. Towtruck and snowplow drivers are keeping busy in Tysons Corner. Check out scenes from around town... during our first snowstorm this week. "I don't predict snowstorms, women or elections" -- words to live by at a local grocery store. Even the geese aren't having much luck. Parents brace themselves for another day shaved off April's planned spring break. Leave Town Now or Stay Home! Travel experts issued major warnings for last weekend. Remember when snow was still sort of a novelty?